Congratulations to the winners - Jennifer Ueno and Ingrid Lavoie! Along with offering handmade items via her beautifully curated online shop, Smile Mercantile, Valerie sources all sorts of treasures for your crafting pleasure... hard to find things like golden paper crowns, German paper maché candy containers, glitter leaves, mercury glass pine cones, tinsel garlands, and vintage shell buttons. Browsing the shop is truly a step back in time! Don't miss Valerie's Tutorials page where she shares enticingly photographed step-by-step projects. 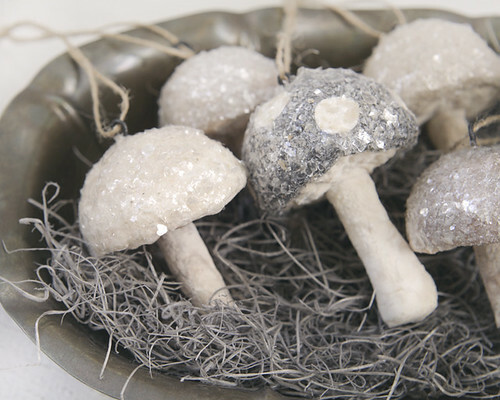 Learn how to make these spun cotton mushrooms (the technique surprised me - you'll use ordinary cotton balls!) 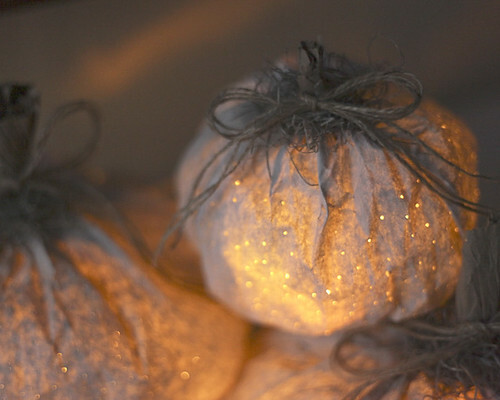 There's even time to create a few of these luminous paper bag pumpkins to decorate your Thanksgiving table. And now let's get to the giveaway. You will need to select one of two choices in your comment. 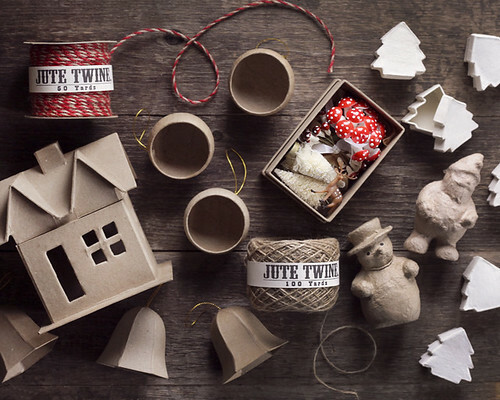 The great big red box includes a fun assortment of paper maché shapes, two spools of jute twine, and a box filled with vintage German mushrooms and holiday miniatures. It is a $72 value. Leave a comment below as your entry through Sunday, November 30, 2014. Include your email address within your comment as Blogger doesn't allow me to see the top portion of the form. You must state in your comment which prize you choose - Trio of Ornaments or Holiday Craft Box. Sorry, U.S. only. Two winners will be selected at random and announced on this post as soon as they have been contacted. Good luck! CHOOSE???? If I have to choose which one .... oh, I guess the Holiday Craft Box, I think! I would LOVE to win this .... been wanting to make houses for Christmas, and this will get me going! Thanks! I would love the craft box. Love the site, such loveliness! What a great giveaway! Since I have more than enough craft supplies I'm going to go with the Trio of Ornaments. My first comment didn't publish so I'll try the anonymous option. I'd choose the Holiday Craft Box, it looks like such fun! The Holiday Craft Box offers so many possibilities. Both lovely prizes. Thanks for the opportunity to win. 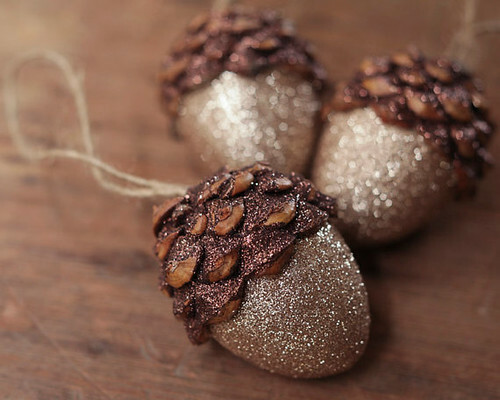 I really like the Silver Shimmer Acorn Ornaments. I would choose the Holiday Craft Box as a prize. Lovely, lovely, lovely...I would choose the trio of ornaments...your creations are amazing! Happy Holidays! Oooo so hard to choose - but I choose the great big red box. Delightful give away. Have a very Happy Thanksgiving. Such a lovely post. Thanks Ann. It woulds be wonderful to win any. If I have to choose then Giveaway #2. Wonderful! It puts me in a festive mood and ready to create! I love the diorama set and would love to win it. My tree is always a small one that we set on the livingroom/diningroom/kitchen island counter top...they would be a wonderful addition to our tree! My Dad always had a small decorated tree that he just covered and put in a closet - to take back out for an instant tree at Christmas! I do decorate my tree....but small is good - LOL! I would absolutely love the Holiday Craft Bix! What a great giveaway! queenmarci8284 at hotmail dot com. Beautiful things! Love the box of goodies and I love the ornaments! Thanks for a chance to win! I have never owned a tree or ornaments! I would love this prize! yarbr012 at gmail dot com. I love both sets!! But I think I would like to enter giveaway #1. Thanks for the chance to win. Just gorgeous...as always... 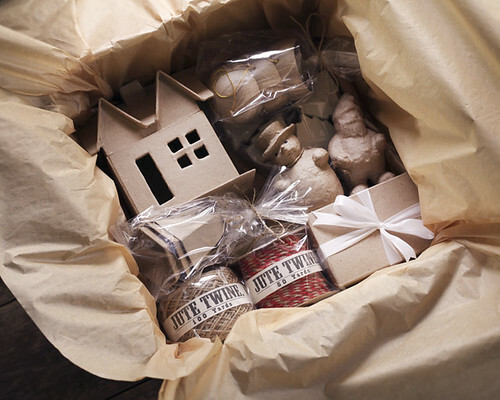 Almost impossible to choose but I would love the Holiday Craft box...Such possibilities... Thanks! I would choose the Trio of Ornaments, they're very charming! Such beautiful work would love trio of ornaments for the holiday, Shaj. 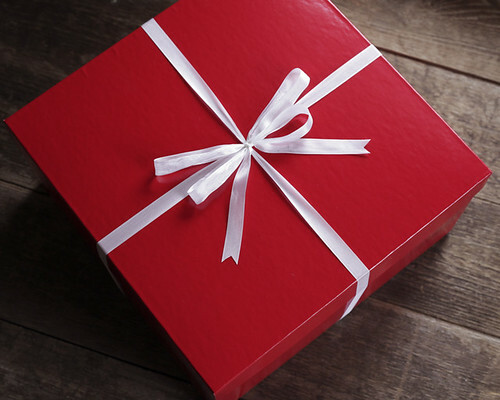 I would like the gift box. 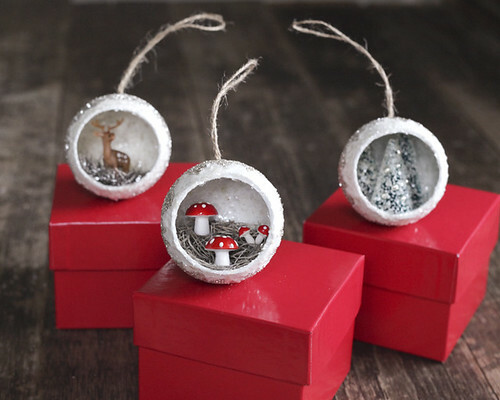 Those mushroom ornaments are adorable. 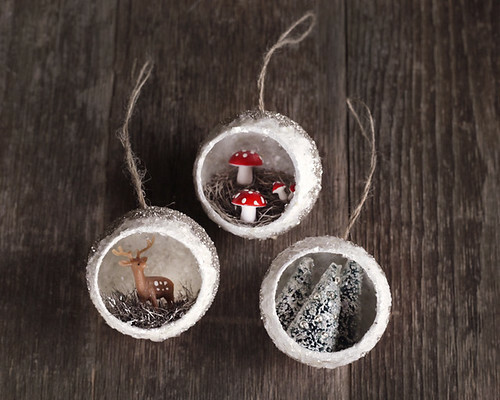 I would love to win the Trio of Retro Diorama Ornaments . They would add a beautiful touch to my tree this year. Oh, man. They're both so great but I'd love the crafts to work on with my niece. :) I hope you had a great Thanksgiving! I love them both. Can I pick "Surprise me" if I am lucky? If not, the ornaments are beautiful. Thanks for the chance :-) Happy Holidays!! 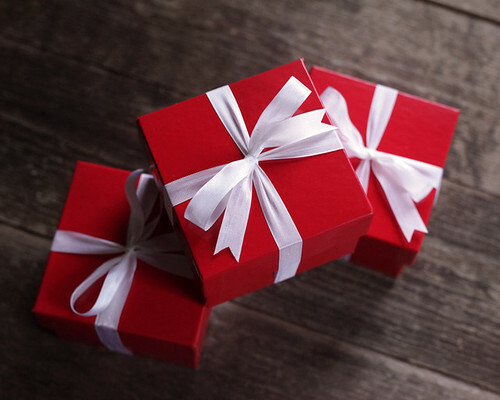 It's hard to choose, but the opportunity to make something always wins - so, the holiday craft box it would be ! I have always loved anything miniature! These two prizes definitely fulfill my wants and desires. I think any artist that works in miniatures is truly talented! Lovely ornaments and the gift box is any crafters dream. Hard to choose, but I think the Retro Ornaments are gorgeous. Love that holiday craft box! These are so exquisitely beautiful, even following the wonderful blog, I could only dream of such craftsmanship. So, as much as I lust for the beautiful big box, I would ask for the wonderful ornaments. This is a great giveaway, I love crafting for christmas. I would love the trio of ornaments! My choice would be the holiday craft box. Just finding your pages nudged me to get busy (a little late) making Christmas things. My email is: mmlkell@aol.com Thank you. helenpierce@ameritech.net really likes the 3 Diorama ornaments that Valerie Loyd has made! Thanks for making them available to a happy winner! Helen P.
The Trio of Ornaments is my choice. Thank you Valerie Lloyd for offering such a wonderful prize. I'd love the Trio of Ornaments for my tree! Sorry if this is a repeat. i wasn't signed in properly. I would love to win either prize, but I might be a tiny bit more excited to win the craft box. Thanks for sharing your creativity. Sorry if this comes through twice. Not sure what happened to the first try...I would choose the craft box though I too have plenty of craft supplies. Wow - I made it in just under the deadline! Is love to have the red box full of craft supplies. Thanks for the opportunity! Merry Christmas! The giveaway has ended. Thanks for all of the entries!